The second annual AP Blitz, a lunch long seminar on Advanced Placement material, began Feb. 8, with many underclassmen getting a sneak peak of the courses offered at Hollywood High. Designed to give students a brief overview of the AP courses offered on campus, teachers and current students will be presenting course background everyday during lunch for the next week and half. This year’s program began on Feb. 8 with Mr. Adisa leading the AP Calculus seminar and will close Feb. 19, with respective AP Biology and AP Physics courses. Daisha Campbell, PAM junior, attended the seminar for AP Calculus, on Tuesday. “It was a good experience, I learned that Calculus isn’t as hard as it may seem.” Daisha said she felt like AP Blitz gave her the opportunity to see that Calculus is something she can handle. “It was a challenge, but I feel like I can do this,” she said. AP Blitz ultimately helped Daisha make up her decision to take AP Calculus AB. “It really encouraged me, I was able to see what the class consisted of, and I realized: it’s not that hard,” she said. Only attending the AP Government seminar to be with her friends, PAM junior, Chynna Tumalad, walked out of lunch surprised. “I feel like it’s hard to come across a teacher who sticks to the subject like [Mr. Wood]. He makes government sound interesting because of the energy he gives out,” she said. Chynna said she hadn’t considered taking AP Government before attending AP Blitz, but now she could definitely see herself in Mr. Wood’s AP Government class next year. AP Blitz has had a positive impact on student registration in AP courses. Daisha commends the develop of the program, and urges all students to take advantage of the opportunity. 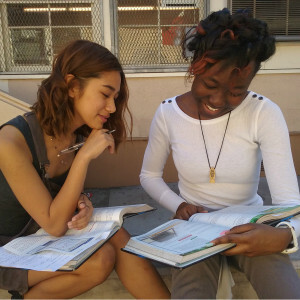 “I do feel like AP Blitz is something that people should attend and something we should continue to have at Hollywood High because it is something that will allow students to see what they’re going to get involved in, before they actually commit to it, ” Daisha said. Excellent story, Destiny. So important to recognize the efforts by our AP teachers and prospective AP students in attending these lunch orientations. AP has much to offer including the possibility of college credit when AP exams are passed and the continued improvement of student GPAs.